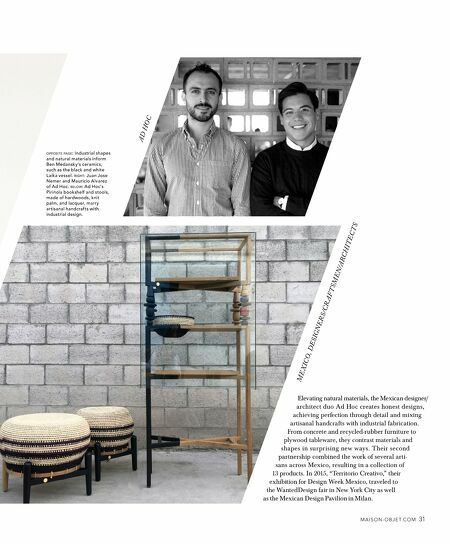 m a i s o n - o b j e t. c o m 31 Elevating natural materials, the Mexican designer/ a rchitect duo Ad Hoc creates honest desig ns, achieving perfection through detail and mixing artisanal handcrafts with industrial fabrication. From concrete and recycled-rubber furniture to plywood tableware, they contrast materials and shapes i n su r pr isi ng new ways. T hei r second partnership combined the work of several arti- sans across Mexico, resulting in a collection of 13 products. In 2015, "Territorio Creativo," their exhibition for Design Week Mexico, traveled to the WantedDesign fair in New York City as well as the Mexican Design Pavilion in Milan. 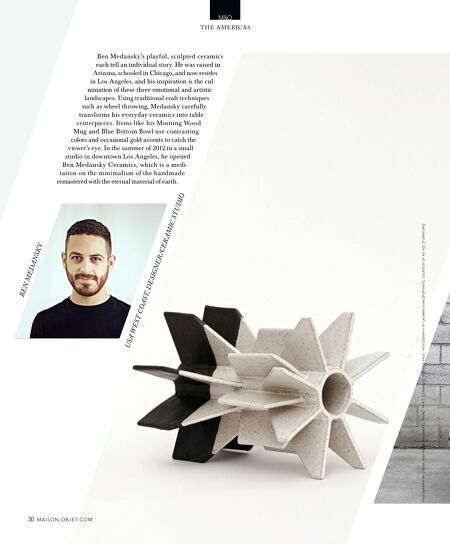 AD HOC mexiCO, Designers/Cr Aftsmen/ArCHiteCts opposite page: Industrial shapes and natural materials inform Ben Medansky's ceramics, such as the black and white Laika vessel. right: Juan Jose Nemer and Mauricio Alvarez of Ad Hoc. below: Ad Hoc's Pirinola bookshelf and stools, made of hardwoods, knit palm, and lacquer, marry artisanal handcrafts with industrial design.